The fight will resume in the courts in December. Earlier this week we told you about the Kuark forest in east Gippsland, a magnificent old growth forest which was about to be logged by VicForests -- Victoria's state owned logging company. The logging plans have been shelved for now thanks to a concerted campaign of citizen science, lobbying and finally, a blockade organised by local conservation group the Goongerah Environment Centre, as well as legal work from Environment Justice Australia (EJA). EJA lawyers Lawyers took VicForests and the Department of the Environment, Land, Water and Planning to the Supreme Court on Wednesday and won an injunction to stop the logging which was planned for a section of the Kuark called the Princes Cut, which contains trees that may be 500 years old. Lawyers argued that logging would have taken place in an area of old growth forest which is required by law to have 60 percent marked as "special protections zones". Such a marking never occurred. "Most Victorians would be shocked to hear that the Environment Department is of the view that it does not have legal obligations to protect the state's old-growth forests," EJA's Danya Jacobs said. Ed Hill from the Goongerah Environment Centre, who had been in the forest for weeks helping document trees, threatened species, and organising the blockade, expressed a mixture of relief and frustration that things had come so close. "It's a relief that this precious area has been given temporary protection, however it's disappointing the state government failed to act and community groups have had to take legal action to force the government to protect old growth forests as they are required to," he said. "It's absurd that the government refused to prevent logging and are now going to spend tens of thousands of taxpayers dollars in a court battle arguing they don't have to protect old growth forests. "The government are completely out of touch with the community, who overwhelmingly support the protection of old growth forests. "This forest is part of Victoria's forest heritage, a rare example of what our forests looked like hundreds of years ago. To continue to destroy these last remaining unprotected old growth forests is not only having a profound impact on biodiversity and the threatened wildlife that depends on them but it's also robbing future generations of experiencing these forests that remain in a pristine untouched state. 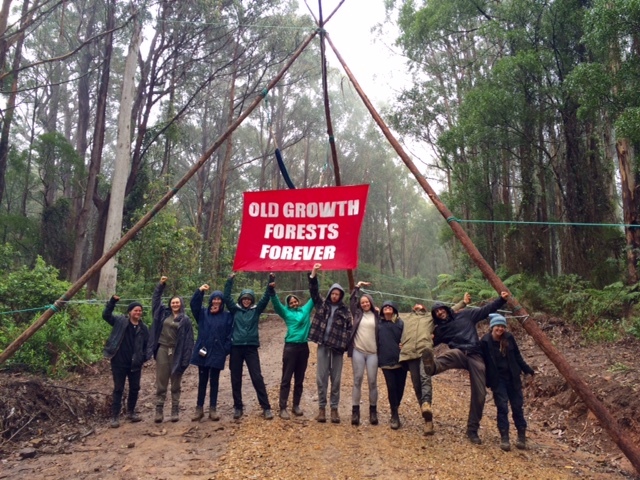 "Twenty people took peaceful direct action to prevent logging from starting as the government failed to protect this forest, now that the Courts have ruled that no logging can take place until legal proceedings are resolved, the blockade camp is celebrating." The celebrations may only last until December, when the case will again be heard in the Supreme Court.